Throughout history, almonds have been enjoyed not only for their delicate flavor, versatility and great crunch, but also their legendary nutritional properties. Almonds (amygdala in Greek, pr. a-Mee_gdah-lah), are a dietary staple in Greek cuisine, mostly used in desserts. Almonds are a tasty and healthy snack that does a lot of good things for our body. The protein in almonds helps to build and repair our bodies, the fiber aids the digestion of foods, and the calcium helps in building and maintaining strong bones and teeth. Although many foods may be good for us, it’s important to remember not to eat too much of one thing. A serving of almonds (about 23) is a great snack to enjoy anytime, anywhere. You can mix almonds into your childrens’cereal in the morning before they go to school, or you can eat a handful of almonds after your exercise. For a special treat, you can mix almonds into cookies or brownies. The word “almond” comes from Old French almande or alemande, Late Latin amandula, derived through a form amygdala from ancient Greek “αμυγδαλή” (amygdálē) (cf. amygdala), an almond. The al- in English, for the a- used in other languages, may be due a confusion with the Arabic article al, the word having first dropped the a- as in the Italian form mandorla; the British pronunciation ah-mond and the modern Catalan ametlla and modern French amande show a form of the word closer to the original. Other related names of almond include mandel or knackmandel (German), mandorlo (Italian for the tree), mandorla (Italian for the fruit), (the Romans also called it nux Graecum meaning Greek nut), amêndoa (Portuguese), and almendra (Spanish). The adjective “amygdaloid” (literally “like an almond”) is used to describe objects which are roughly almond-shaped, particularly a shape which is part way between a triangle and an ellipse. The almond tree (Prunus dulcis, syn. Prunus amygdalus, Amygdalus communis) is native to the Medieterranean and it grows in warm and dry places. In the Cypriot dialect, the almond tree is called “athassia” and the fruit is called “athassi”. The origin of the word comes from the Greek “Θασία αμυγδαλή” (thassia amygdali), which refers to the almond tree from Thassos island, which was renowned for its delicious almonds. The non domesticated almond tree has been found in Greece in archaeological excavation sites, dating from 8.000 b.C. upto 3.000 b.C. when it became domesticated. The almond has since been spread by the Greeks along the Mediterranean shores into northern Africa, Europe and Asia. More recently, we see that the almond tree is cultivated in other parts of the world, such as California. Explorers ate almonds while traveling. Before long, almond trees flourished not only in other parts of the Mediterranean, but in other places as well. The blossoms of the almond tree are considered by the Greeks as a symbol of wellness, health and fertility. For these reasons, nowadays, almond candies (koufeta) are offered after the wedding but many years ago almond pastries, such as amygdalota, pastitsia or kourabiedes were offered at engagements, weddings or other family celebrations. In Cyprus, pastitsia were offered during engagements (although this tradition seems to be slowly fading), and loukoumi tou gamou (wedding cakes), also made of almonds, are still offered, for the couple to live a happy life! Almonds have been an integral part of the Greek diet, being frequently used in pastries and other foods. When we were kids, we would pick the almonds when they were still green and tender. The inner, woody shell had not yet developed and we ate them as a snack. The green almonds had a crisp crunch, they were juicy and tart. If we had some salt, we would put a little bit on them, after each bite, which makes them irresistible. The green almonds are only around for a few short weeks in early spring, so if you have almond trees in your area, don’t miss them. Eat them right from the tree or add them in salads. As the almonds ripen, the green, fluffy hull becomes darker and it starts splitting open. Inside, the shell is now drying and will turn into wood. You now have to break the shell in order to get the fruit (nut). For centuries, almonds have also been utilized therapeutically – both the wild variant (bitter) and the domesticated variant (sweet). The almond fruit (nut) is rich in vitamins and features anti-aging and healing properties. It also stimulates the skin thoroughly! For example, almond oil, obtained from the dried kernel of sweet almonds, has traditionally been used in cosmetics, as it is good for the skin, the hair, the nails etc., as well as for massage therapy. Hippocrates considers the almond being a precious ingredient, both nutritionally but also used to produce medicine. Dioskourides mentions the medicinal properties of almond oil and its use to produce myrrh. Plant resins have a very long history and almond resin was documented in ancient Greece by Theophrastus, regarding its use in pharmaceuticals. Almonds are a nutritionally dense and filling snack: A 1-ounce or 30 grams, 160-calorie serving of almonds, or about a handful, is an excellent source of vitamin E and magnesium, and a good source of fiber and phosphorous. Almonds also have unsaturated fat (13g), saturated fat (1g), protein (6g), potassium (200mg), calcium (75mg), iron (1mg) and fiber (3.5g). All of these things may help provide that “full” feeling everyone wants after a meal or snack. Surprisingly, the almond is not a member of the nut family, but rather is actually a family member of stone fruits such as nectarines, peaches, plums and cherries. For this reason, some people refer to an almond as a fruit. Many Greek recipes, call for blanched almonds. 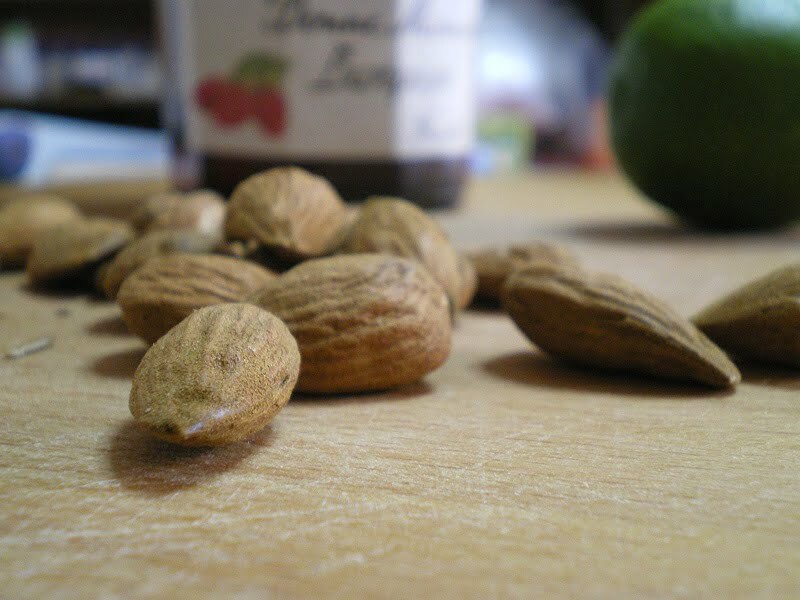 Whenever you need blanched almonds, you do not need go to the supermarket to buy them. You can easily do this at home, in just a few minutes. With the Christmas and New Years holidays just around the corner, we will soon have a lot of cakes and cookies to make, which will need almonds, either blanched or roasted. So instead of writing the procedure in each recipe I thought it would be best to write the procedure once and put a link to each recipe, where necessary. Phyllis, was the daughter of a Thracian king, who fell in love with king Theseus’ son Demophon. The young man had ended up in Thrace (Northern Greece), while sailing home from Troy, and the king gave him part of his kingdom and married him to his daughter. After some time Demophon got homesick, so he asked his wife if he could visit Athens for a while. Phyllis agreed after he had promised he would be back soon, and off he sailed. Many years passed but Demophon did not return on the agreed time. Phyllis died of grief (according to others she committed suicide) at the place they were married. The gods, out of compassion, transformed Phyllis into a tree. When the wandering, full of remorse, Demephon returned, he found Phyllis transformed into this naked tree without leaves and flowers. Desperate, he embraced the tree, which suddenly bloomed with flowers and leaves. The almond tree, became a symbol of hope, showing that love can not be defeated by death. The almond tree in Greece is the first daring plant to blossom during winter (January – February), anouncing that Spring is coming! Why, in such a hurry? Put the almonds in a small pot and cover them with water. Put them on the heat and bring to a boil. Remove immediately from the heat and add cold water. Empty them in a colander. Squeeze each one, holding it with your thumb and pointer finger. The skin will loosen once you touch them. Be careful as they they slip away. Put them on kitchen paper to drain. To roast almonds, shelled or not, put them in a baking tin. Preheat the oven to about 150°C and bake for 15-20 minutes or until lightly golden.